Border types and conflicts will be covered on the GED Social Studies test. Borders cause no end of trouble. They seem like a good idea, indicating where one country’s holdings end and another’s begins, but problems arise when leaders disagree where exactly that line is. Natural borders are easy. They follow a river, a mountain range, a coastline, or some other physical feature that is easily identified. The people who live in states that border along the Mississippi know exactly when they enter or leave their state, at least on the river side. Natural borders have a further advantage: They are more easily defensible. Ancient Egypt was relatively safe from invasion, protected by desert on the west and south and the Red Sea to the east. Invading Italy required climbing over the Alps or sailing across the Mediterranean Sea first. Even lesser natural boundaries, such as the Rhine River, create defensible barriers. Natural boundaries also divide cultures, which become nations. For example, people on the north side of the Alps spoke German, while those on the south side spoke Italian. The two cultures developed separately, intermingling when required but developing unique cultural identities and languages. The English Channel is a natural boundary between Britain and continental Europe, protecting the British Isles from invasion (with minor exceptions) and creating a culture and language different from those of the mainland. Artificial borders can cause major geopolitical conflicts. Where you see a straight line on the map, you’re looking at an artificial border. The settlers in the original 13 colonies landed on the coast and gradually moved inland. Because the colonies were started separately, they needed boundaries to keep themselves apart. In some cases, the boundaries followed a river or lake. The northern boundary of New York State follows parts of the Saint Lawrence River and Lakes Ontario and Erie. But the straight lines are where some negotiators decided to say, “Let’s just call this the border.” If both parties agree, as in the case of state or provincial borders in North America, there’s no problem. Within the United States, the people on either side of the borders are the same, the culture is much the same, and so are the economies of adjacent states. 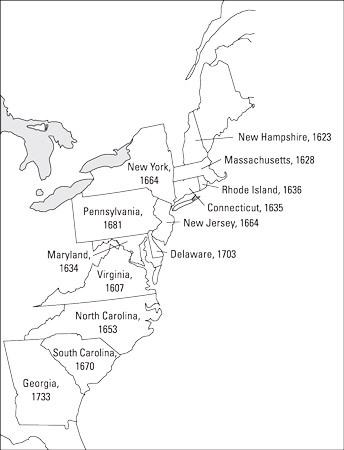 Map of the 13 colonies. Elsewhere, such as on the African continent, artificial borders have become a major problem. They were drawn by the colonial powers of the day to delineate areas from which competing colonial powers could extract resources. The borders ignored local ethnic, cultural, tribal, or linguistic groups. When the colonial powers left, the newly independent countries faced the problem of integrating people who may have been traditional enemies. The tragic genocide in Rwanda was caused in part by such ethnic differences. Divisions of countries in the Middle East followed a similar pattern. Areas were severed and made into independent countries without regard for tribal or religious associations. One result is that in countries such as Iraq, people of different branches of Islam live within the same borders. Strong religious tensions among these branches have made the creation of a unified country very difficult. Rebellions and civil uprisings along ethnic lines are a common occurrence. 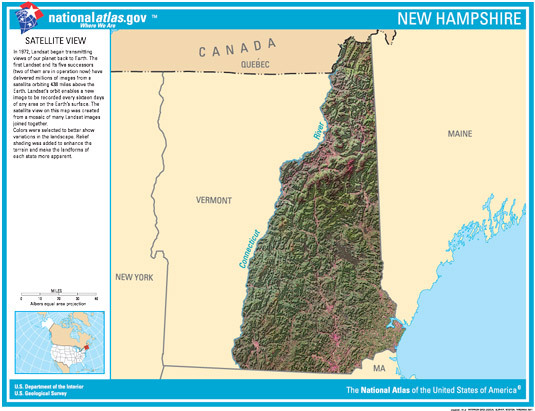 This map combines a satellite view with a standard map outline to show the state of New Hampshire. Judging by the image, which border is likely to be mostly a natural one? The border between New Hampshire and Maine is almost completely straight for most of its length. That means it’s probably an artificial border. The same can be said for the border with Maryland. That means Choices (B) and (C) are wrong. However, the border with Vermont is irregular, and a close look at the map tells you that the Connecticut River runs along that line. This boundary is a natural border following the Connecticut River. The correct answer is Choice (A).